I am GLEEFUL, Blindspotters. Gleeful I say! 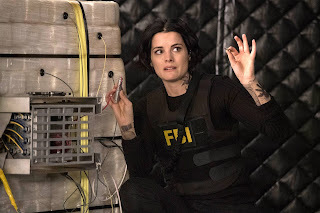 My primary reasons being: Jeller, Team Blindspot feels overload, Zappata in a white shirt and sassy high ponytail, Remi/Roman sibling problems, stressful action and an episode title that I do not have to IMDB to remember. Let's talk about "Mom" shall we? No case of the week this week, yahoooooo! You know I love this show. You also know writing about the case of the week is my least favorite part of reviewing Blindspot. I just want to get to the goodies. Perhaps, I'll rethink the format next year. Things to mull over hiatus. Anyway, Blindspot doesn't dilly dally around; it jumps right into the action. To which I say "FINALLY." We have two episodes left, Gero. Get cracking! We pick up immediately on Jane and Roman's fight. I may have shrieked a little. Roman is extremely good with a knife, so I was nervous. I couldn't help it. But Jane is Jane and she puts her little bro down. There's some kind of sleep coma move she does. We'll add "Jedi Master" to her list of skills. Roman is... upset, which is totally understandable. I feel you, bro. Jane did a bad thing. We all agree the zipping was not good. But also: You are a serial killer, Roman, so maybe just ease up slightly on the condemnation? I mean you literally confessed to killing an innocent woman last week. I'm just asking for a little perspective. Roman: The more I remember, the more I hate you. Roman's flood of memories is incredibly convenient, but Blindspot does a nice job of handling it. He wasn't dosed with zip again and again like Jane was. Roman had one dose and it's wearing off (just in time for the season finale, TA-DA!) Just because I'm happy with them doesn't make Blindspot immune to my snark. We all knew it was headed this way. Roman would learn of Jane's betrayal and any trust she built with him would be gone -- and rightfully so. Upset that her brother officially hates her, Jane reminds Kurt that it was his and Nas' idea to lie to Roman. I will admit that I forgot about that. Way to go, Kurt. But my logic-embracing, compassion-filled Kurt Weller is back with a vengeance! He tells Jane like it is: "You had to lie because you knew. You knew what he was and you were scared of what he'd do if he learned the truth." There it is. The truth about Roman -- or at least what Jane has felt about him deep down and the real reason she zipped him. Blindspot has set up a very nature versus nurture examination in both Jane and Roman. After all the discussions and all the lies, what this really boils down to is choice. Free will, my friends! We all have it -- memories or not. Not all of Jane's memories have come back, but she knows and remembers enough. At the end of the day, Jane chooses to be good. Or at least she makes a valiant effort. Her fear with Roman is that he wouldn't make the same choice. She wanted the zipping to at least give him the opportunity to choose differently -- to give him the chance at a different life and way of being. It was still wrong; but as always with Jane, her intent was good. Still... love doesn't excuse the wrong choice. In fact, too many people are using love to manipulate Roman (side-eyeing you, Shepherd), so Jane really needed to be the one person who didn't. However, that doesn't excuse Roman's choice either. The thing is... Roman was shown a different way. He worked with the FBI. He saved lives instead of taking them. Not to mention, Roman's memories of Sandstorm and Shepherd returned. He had at least 99.9% of the facts. Both the FBI and Sandstorm embraced and rejected him; both Jane and Shepherd loved and betrayed him. Neither choice was perfect, but there clearly was a right one. Roman chose Shepherd; he chose Sandstorm. Roman picked up the gun and shot at Jane. Roman can make all the justifications he wants, but he willingly chose the wrong path. Jane's lies are on her, but that's on him. This is what Jane feared, but her blindspot for Roman clouded that gut instinct -- that after all the nurturing and showing him another way, Roman would still choose evil. Not because he was forced to, but because he wanted to. The good news is that this is only the second-to-last episode. We have one more to go and maybe, just maybe, Roman will prove Jane's belief in him right. However, "Mom" clearly showed that her fear of him was not misplaced. Team Blindspot finally gets the upper hand on that weasel Parker -- his girlfriend Devon is pregnant. So in exchange for her safe transfer to London, Parker offers up one of Team Sandstorm's locations -- and it's a big one. It's a training facility that is an exact replica of the New York FBI field office. Thanks a lot, Borden. Man I hate that guy. Team Sandstorm's goal (or so it seems) is to infiltrate the New York field office and gain access to Patterson's lab. Initially, the feed of the attack is a trick which forces the building to evacuate and leaves it open to Sandstorm's entry. Then, things really get dicey. Patterson locks down her lab with Zappata inside. She also locks down the building so Sandstorm is also trapped, but Shepherd wants the code. She lines up the agents and begins executing them one by one until the FBI Director gave up the codes. Listen, I never liked this guy. He was a cantankerous curmudgeon who never listened to Jane or Weller, but man did he go down in a blaze of glory. The face off with the FBI and Sandstorm, and the director's refusal to give the order to stand down, was EPIC. After the gun fight, he adamantly refuses Shepherd's demands, even when she begins to execute his agents. Now, some may disagree with his choice but I didn't. These are not civilians. As tragic as their deaths are, they were trained for this. This is what they signed up for. It's what makes them patriots and braver men and women than I'll ever be. Pellington: Your plan is flawed. It relies on us being stupid and cowardly. And we are not those things. We are the FBI. Unfortunately, when Shepherd agrees to grant mercy to whoever gives her the code and to the FBI Director Pellington, someone breaks. Briana -- who I think is Weller's assistant -- gives Shepherd the code that overrides Patterson's. And then she kills the Director. For a character I didn't like very much, it's a devastating death. It just shows how, at the end of the day, he was on the same side and Team Blindspot. Patterson pieces together what Sandstorm is after: the Homeland Security Intranet. Is that a thing? Homeland Security made all high-value targets accessible through Patterson’s lab. That... really didn’t seem like a good idea, Homeland Security. Be more secure than that in real life please. Sandstorm is going to bomb high-value FBI buildings using Patterson's systems. Jane and Kurt make their way back to the FBI headquarters in the what feels like the longest car ride in the history of the world, break their way into the building, and start diffusing bombs. That leaves Reade, Zappata, and Patterson to take on Sandstorm and try to stop the other attacks. When Patterson starts the overload, it will go in phases and unfortunately lead Sandstorm directly to them. It will be Reade and Zappata against an army. Reade: We’ll buy you as much time as we can. Reade and Zappata understand the risks. They know what they are walking into and are willing to lay down their lives to not only stop the attacks, but to protect Patterson. I was extremely emotional. THESE ARE MY CHILDREN. DO NOT KILL THEM. Since they are facing impending death, Zappata decides this is the perfect time to tell Reade that his plan to leave the FBI and take a job as an instructor at Quantico is the stupidest thing she's ever heard. Tasha ain't down with it. Reade: You really want to talk about this now? Well... why not? Reade is worried he can't be the same agent he once was. Zappata, accurately, tells him that his experiences will only make him better. He understand what the victims are going through. She's not wrong. Reade and Zappata are able to fend off the Sandstorm goons, while Patterson completes the system overload. It gives Patterson time to alert Homeland Security to the attack. Unfortunately, just as the battle seems won, that weasel Parker shoots Zappata extremely close to the heart. That's about when I started to scream. Reade refuses to leave Zappata's side as she bleeds out, even as she begs him to protect Patterson. That's about when I started to cry. THIS IS SO STRESSFUL. Fortunately, Jane and Kurt diffuse the bombs which forces Shepherd and Roman to escape through a hole in the wall of Borden's office. Seriously? Do they not have security cameras? Nobody caught this guy tunneling his own version of Shawshank Redemption? In the end, Team Blindspot stops four of the other targets. Two buildings, however, are bombed but with minimal law enforcement casualties and zero civilian. Zappata is hospitalized and even though it doesn't look good at the end of the episode, I feel confident she'll make it. Unfortunately, the attack on the FBI buildings was not phase two. To be fair, Mama Sandstorm clearly manipulated Roman again in their one-to-one. Did anyone else find it a little ridiculous that Shepherd kept screeching about how she didn't have any time, yet managed to have a five minute warm and fuzzy chat with her son? No? Just me? "Stop being nitpicky Jen"? Okay. Shepherd: Everything I’ve done, I’ve done for love. Roman: Does that include trying to kill me? Shepherd: Why did you choose Jane over me? You didn't choose Remi. Remi was gone. You know that. You chose a stranger over your own mother. Roman: Because Jane wasn’t asking me to choose. I found this exchange refreshingly honest between this completely messed-up mother and son duo. To be honest, I was hoping Roman would hold on to the fact that Jane never asked him to choose. But I think he just feels too betrayed to think clearly. Shepherd did what Shepherd does: she capitalized on Roman's emotions and used them against him -- this time it was his anger toward Jane. She used all the right words and all the right fears, but it's still Roman's choice. That's the tragedy of Roman. He's like a ping pong that Jane and Shepherd slap between them. At some point, Roman has to make a decision about who he is. Not because of what Jane or Shepherd tell him, but because it's who he wants to be. We did finally discover what phase two is. Weller is led away by Secret Service to a secret bunker where all the deputies of government agencies like the CDC and CIA meet. There are A LOT of flashbacks to characters from previous episodes who were involved with the tattoos. I honestly don't remember them all, but what's important is the tattoos led to members of COGS. It's the program Nas referenced along with the Truman Protocol. Essentially, COGS is a team that would become the new government in the wake of a massive attack. The members are all hunkered down in the even that the government falls -- they will survive... aka The Truman Protocol. Weller thinks this was Shepherd's phase two all along. The members of COGS are the government Shepherd wants and she's going to burn down the current government (with the explosives from Thailand) to get it. Well, Jeller shippers, it's been a long road. But we've crawled through the barren wasteland and arrived at Eden. The pay off is absolutely worth it. There's a really beautiful lead-up to the kiss throughout "Mom" that really encapsulates the struggles Kurt and Jane have been through together this year and what they've learned from them. This season has been a lot about distrust and betrayal for Kurt and Jane. "Mom" sees them working together as the cohesive team we knew them as in season one. Kurt talks Jane through diffusing the bomb, because she has little hands, by referencing the game "Operation." Jane balks because she's never played "Operation." Kurt teases her and says, "How do you know? It could be one of your hidden talents." It's much-needed levity in a tense moment. Jane is able to relax and diffuse the first bomb, without setting it off. Go team! Kurt was able to process Jane's lie about Roman killing Emma Shaw last week by holding on to something true -- something he knows without question. Kurt trusts Jane in the field. If he trusts Jane with his life, then maybe it's possible to see beyond Jane's mistake to the good heart Kurt knows is there. The action in "Mom" really serves as the backdrop for showcasing how the trust between them has solidified. Kurt has Jane's back as she diffuses the final bomb, taking on several Sandstorm agents by himself. There's a levity between Kurt and Jane even though the world around them is chaos. There's an unspoken truth as they battle to stop the very evil Jane was sent to help unleash. At the end of the day, they have each other's backs. They both believe in the same things. Together they can stop this. That's enough to fight for... and to die for. Jane warns Kurt as they close in on Shepherd and Roman that they won't be taken alive. Kurt: Jane, you take Shepherd. Jane: (sighs with relief) Thanks. I found this to be such an act of love and kindness on Kurt's part. He didn't want to force Jane to make an impossible choice. Kurt was willing to make it for her and to spare her even a little pain. Roman reverting back to form is grenade to Jane's soul. She's absolutely heartbroken and also... afraid. She's afraid that once her memories return the same thing will happen to her. Kurt says, "You're not your brother." He's right. She's not. It's taken a year of healing from all the lies and painstakingly rebuilding the trust between them for Kurt to remember what he's always known. He knows who Jane Doe is. Kurt Weller operates on gut. When he met Jane, he instinctively believed she was a good person. This belief (and his name tattooed on his back) made him believe she was Taylor Shaw. Kurt got it wrong. Jane wasn't Taylor Shaw, but that doesn't mean his gut instinct about her was wrong. It's taken Kurt a while to sift through all the lies and betrayal, but essentially that's the singular truth he's come away with. At the end of the day, when push came to shove, Jane chose Kurt over her brother. She chose the FBI over Sandstorm. Jane has made a lot of mistakes, but her desire to do the right thing never dimmed. She values human life. Jane cares about the team. She's strong and never stops fighting. Her compassion and protectiveness is innate. And these are all the things Kurt Weller loves about her. Kurt: We are not our families. Jane I know who you are. That is not who you are. Kurt Weller knows who Jane Doe is. He's always known. Her name doesn't matter. What matters is her heart. And then... Kurt kisses her. Jane has been lost for a long time. She's been searching for who she is, hating who she was and fearing who she'll become. Yet, Kurt's belief strengthens her. It helps her believe. Despite losing her brother and not knowing how to stop her mother, when Kurt kisses Jane she feels hope. She's found. Jane may not know everything about who she is, but she knows she loves Kurt Weller. For now, that's enough. It's everything. It's been a rough season for Kurt and Jane, and those show has suffered from their distance, but this moment between them feels earned. We made it! 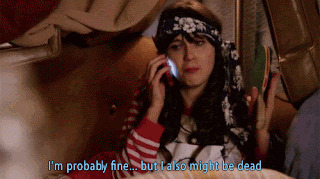 And then, next week's finale promo shows Kurt and Jane on the verge of hooking up. "Can you hand me my gun? You’re under arrest." Pellington, your sass was on point. Way to go out strong. The therapist 100% told Reade to consider not being an FBI agent. Then, he decides not to be an FBI agent and acts like she never said that. THIS WOMAN TRIES ME. Zappata's single tear while Shepherd executed FBI agents broke me. I couldn't remember how many phases of Sandstorm there were. I'm a little floored we're only on two. Weller body-rammed two Sandstorm agents. Then single-handedly took down a dozen more while protecting Jane. Is it warm in here? I need Reade and Zappata to admit they are in love in the finale. Blindspot is renewed for season three! Yahoo! I absolutely believe we are getting a Jeller hook-up because they were on the bubble. See, the bubble isn't all bad.